Jos Hooiveld grabbed a point for second-placed Southampton as 10-man West Ham missed the chance to extend their lead at the top of the npower Championship. The Dutch defender struck late in the second half of this top-of-the-table clash to cancel out Mark Noble's penalty, with the Hammers playing a man light from the opening stages for the second successive game. This time it was Matt Taylor who saw red following a shove on Billy Sharp after 18 minutes. The 10 men battled to victory against Millwall last weekend but could not hold out against their promotion rivals Saints and remain one point clear at the summit. 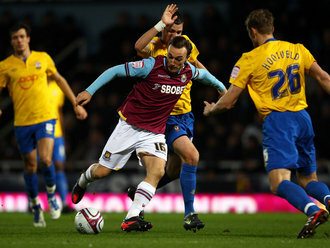 Just like Kevin Nolan's last week, Taylor's dismissal was utterly needless. His side were well on top, with Ricardo Vaz Te and Winston Reid going close, and had just been awarded a penalty at the third time of asking. Referee Lee Probert had waved away appeals for handball against Rickie Lambert and Hooiveld, but had no option but to point to the spot after Noble was blatantly tripped in the area by Morgan Schneiderlin. However, tempers promptly flared down by the right corner and Taylor, who must have covered quite some ground from his position at left-back, charged into the melee and pushed Sharp to the floor. Probert whipped out a straight red card and Taylor trooped off before stand-in skipper Noble stepped up to coolly send Kelvin Davis the wrong way for his seventh goal from seven penalties this season. West Ham had played for 81 minutes without regular captain Nolan against Millwall and another resilient display was called for. Goalkeeper Robert Green certainly stepped up to the plate before the interval with a stunning double save from point-blank range to deny Sharp and another fine stop from Lambert. Southampton tried to make their numerical advantage count after the break but the hosts were holding firm. Reid deflected Jason Puncheon's shot wide and Joey O'Brien hacked the resulting corner off the line with Sharp about to strike. However with 15 minutes to go Hooiveld, just as he had done when Saints beat the Hammers at St Mary's in October, found the net from a set-piece. The home defence could not clear Danny Fox's free-kick and Hooiveld stuck out a boot to prod the loose ball past Green. West Ham still had a chance to win it but Davis saved well from substitute Nicky Maynard to ensure Saints stay hard on the Hammers' heels. West Ham Green, O'Brien, Reid, Faye, Taylor, Noble, Tomkins, Collison (McCartney 21), Faubert, Cole (Maynard 65), Vaz Te (O'Neil 71). Subs Not Used: Baldock, Lansbury. Southampton Davis, Richardson (Connolly 80), Hooiveld, Fonte, Fox, Do Prado (Puncheon 55), Cork, Schneiderlin, Lallana, Lambert, Sharp (Hammond 83). Subs Not Used: Martin, Lee. Booked: Sharp, Lallana, Cork, Fonte.